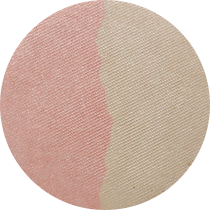 Natural blush-bronzer hybrid which combines the customized blush effect with touch of sunkissed hues. The result is seamless, soft-focus and multidimentional color. INCI: mica, titanium dioxide (CI 77891), zinc oxide, magnesium stearate, simondsia chinesis seed oil, tocopherol, CI 77489, CI 77491, CI 77492, CI 77288, CI 77007. Product consists of naturally concentrated heterogeneous pearl particles which have various light reflection levels and gives a luminescent highlight to the skin with dewy finish. Can be used from day to night. 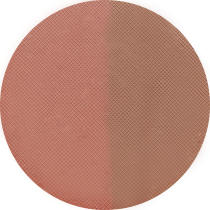 Highlight shades- golden and pink. INCI: mica, titanium dioxide (CI 77891), zinc oxide, magnesium stearate, simondsia chinesis seed oil, tocopherol, CI 77489, CI 77491, CI 77492, CI 77499, CI 77288, CI 77007. 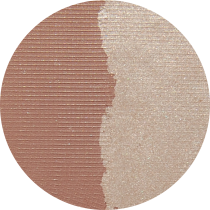 Natural duo with bronze pigments which ads depth and dimention for a sunkissed glow. Duo consists of bronzer and a highlighter. Velvety sheer, air-light formula sweeps on softly creating a healty-looking and radiant finish. This product is cruely free and vegan. INCI: mica, titanium dioxide (CI 77891), zinc oxide, magnesium stearate, simondsia chinesis seed oil, tocopherol, CI 77489, CI 77491, CI 77492, CI 77499, CI 77007.